Since the late 1920s Muslims in Trinidad and Tobago have developed polemics around particular issues of understanding of the practiced faith. Here is an example from 1950 in which Haji Ruknudeen Sahib, the Shaykh ul Islam of Trinidad and Tobago at the time rebutting the very public (published in a national newspaper) disagreement between Mufti Ameer Ali (leader of Ahmadi sect). The issue at hand is the required number of prayer rotations of the Ramadan night prayer (taraweeh). Copy courtesy Maulana Kavir Mohammed. A statement from the Mufti of the “Trinidad Muslim League” on Taraweeh prayers appeared in the “Sunday Gaurdian” 2nd of July 1950 and (with some addition) in the League Bulletin of the 1st of July 1950. Coming as it did from a camp which calls itself “Ghair – Mokallid” and not Hanafi Ahles Sunnat wal Jammat, we regarded it as the teaching meant for their followers and did not, therefore, consider it worthwhile to publish its refutation. But now that it is being given a propaganda twist to mislead the unwary among the Sunnat wal Jammat which is evident from a handbill issued lately, we deem it necessary to clear up the misrepresentations and errors contained in the Mufti’s statement. The statement in question is full of misrepresentations. The writer has selected traditions of the Holy Prophet (peace be with him!) at his own sweet will, cut from the context, given his own unwarranted interpretations and deduced wrong conclusions. It is a case similar to the one who said that he could prove prohibition of prayers from the Holy Quran and quoted the verse “O you who believe! Do not go near prayers” cutting off the immediately connected portion “if you are intoxicated”. 1. 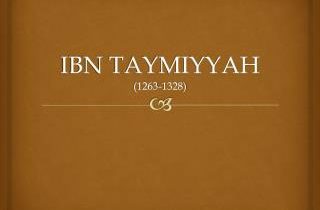 Just as, in opposition to the practice of the overwhelming majority of the Muslims, the writer has curtailed the Taraweeh prayers from twenty rakaats to eight, similarly by mentioning the abstention from food and drink only by deleting the mention of abstaining from sexual indulgence during fasting, he has opened the way for his followers to the minimization of the rigors of the discipline of fasting, for which he must have already received their vote of thanks! 2. It is a well known fact that the Ahles Sunnah wal Jammah, to attack and misrepresent whom the writer of the statement has made it his life mission, have formed the overwhelming majority of the total Muslim Population of the globe from the time of the Holy Prophet (peace be with him!) down to the present day. Now, as regards Taraweeh, even the Mufti’s teacher, Maulvi Muhammad Ali, President of the Ahmadiya Anjuman of Lahore, had to admit that the practices of twenty rakaats is “generally maintained throughout the Muslim world”. (The Religion of Islam, p.454). In Trinidad, all Muslims without exception used to read twenty rakaats before the “Mufti’s” “mission of mercy”. Even today, barring the handful followers of the League, the overwhelming majority of the Muslims of the Colony adhere firmly to the twenty rakaats. To reduce this majority all over the world and in Trinidad to “some Muslims” by a simple stroke of the pen is indeed a feat of propagandist courage! 3. To confuse “Tahajudd” with “Taraweeh” is another master stroke of clever propagandist misstatement. Even the meanest student of Hadith knows that these are two different things. The writer would have done a great service to Islam if he quoted the Holy Prophet (peace be with him!) on this point from some books of Hadith which, has been presumably discovered by him anew. Also, he would render a great service to his followers if he could compile a complete dictionary containing the new meanings and connotations of Islamic terms, the League’s writer should know that according to the accepted scholarly verdict among Muslims, “Taraweeh” and “Tahajjud” are two different prayers and Taraweeh is Taraweeh whether offered in congregation or individually. In this connection, an act of clear misinterpretation is the misquotation of the Hadith from Lady Ayesha (God be pleased with her! ), which has been presented as “decisive” Hadith for proving eight rakaats of Taraweeh. In the first place, the reference of the Hadith had been purposely misquoted. Anyone who sees Bukhari will find that the Hadith in question is from “Kitab ut Tahajjud” and not from “Kitab ut Taraweeh”. The writer has changed has changed the word “Tahajjud” to “Taraweeh” simply t prove his false case. In the second place the wordings of the Hadith have been deliberately cut down. The actual Hadith says: “The Apostle of God (peace b with him) would not increase upon eleven rakaats, either in Ramadan or in (months) beside it”. The writer stopped at the word “Ramadan” in his quotation to deceive his readers that the Hadith related to Taraweeh, although the Hadith actually relates to Tahajudd which is borne out plainly by the words “in Ramadan or in (months) beside”. 4. In the two other traditions which the League’s writer has quoted from Muatta and Ibn Majah respectively, he has similarly tried to mislead the ignorant public. We would not go at this time into the discussion of the merits and the implications of those traditions with reference to the full context, simply because we are examining the “Mufti” on his own grounds. As such we would take these two traditions only and not those many of which prove the case of twenty rakaats clearly. Now, as to Hadith of Ibn Majah. Let the Muslims read it thoughtfully from the “Mufti’s” own quotation. It makes no mention of the number of the rakaats of Taraweeh. Its main function is to prove the validity of congregational Taraweeh. The fact that on one occasion the prayers progressed “until about half the night had passed “shows, on circumstantial evidence that the number of rakaats must not have been merely eight but pretty more. The advice that: “He who offers his prayers with the Imam until he departs, it is equal to his standing (in prayers) all night” is a glad tiding for those weak and sick persons who are incapable of keeping the vigils during the nights of Ramadan or of keeping up Tahajjud prayers and does not in any way form a prohibition against Nawafil and Tahajjud, which Muslims have been persuaded in a number of traditions to keep up especially during Ramadan nights. As regards the Hadith of Muatta, the “Mufti” did not have the courage of quoting complete along with the marginal note present the that book, for that would have exposed him. But even as it stands the Hadith only lends its support to the practice of twenty rakaats of Taraweeh. For, it plainly says (the translation is by the rakaats (20 Taraweeh and 3 Witr).” Now, who were these people of the time of Omar? The time of Omar’s Caliphate commenced three years after the Holy Prophet’s demise and the people in question were the Holy Prophet’s companions, about whim he (God bless him!) himself had said “My companions are like stars, whomsoever you follow, you will be guided aright.” The Mufti has used the word “erroneously” at one place, which is a fling directly at those noble personages. He should have felt some prick of conscience if he has any regard for Islam. From this Tradition, even a Muslim of ordinary intelligence can understand that the consensus of opinion of the holy Companions was on twenty rakaats of Taraweeh and that it alone is the Holy Prophet’s Sunnah. For, it is plainly blasphemous to say that all the Companions had combined to oppose the Holy Prophet. Omar’s advice to Ubayy bin Kaab and Tameem Dari for eleven rakaats, even if it is taken to be a correct report, should be positively taken to be an exceptional affair. Because the very book of Muatta which gives this hadith also gives on the margin the proof of the fact that Omar, Osman and Ali (God be pleased with them) and the Muslims of their times stuck to twenty rakaats. If the “Mufti” has not quoted the Hadith in question from some propaganda leaflet imported from elsewhere, he can read it in the book. The Arabic too is not stiff there! He can read in other books of Hadith also that Omar was in the forefront of those who stood for twenty rakaats of Taraweeh. 5. The “Mufti” has tried to play on the words “Sunnati Omara” and has endeavored to make out a case. Let him know that, according to the Holy Quran and the Hadith, obedience to the Holy Prophet (God bless him!) means obedience to God and obedience to the Righteous Caliphs means obedience to the Holy Prophet (may his memory be ever green!). If the “Mufti” reads the Hadith literature, he will find that it was none else than the Holy Prophet (God bless him!) who commanded: “Hold to my Sunnah and the Sunnah of the Righteous Caliphs”. It would be the height of ignorance to suppose that the Sunnah of the Righteous Caliphs was something above and beyond the Sunnah. Its merit lay in the fact that it could act as the final adjudicator, after the Holy Prophet’s demise, if there was any difference of opinion among Muslims of the earlier days and also when the disruptors of Muslim unity of the latter days were to try to create confusion among Muslims, wrongly interpreting “Taraweeh” as “Tahajjud” and many things besides. The credit of Omar’s act consists in lending to the institution of Taraweeh the weight it deserved. 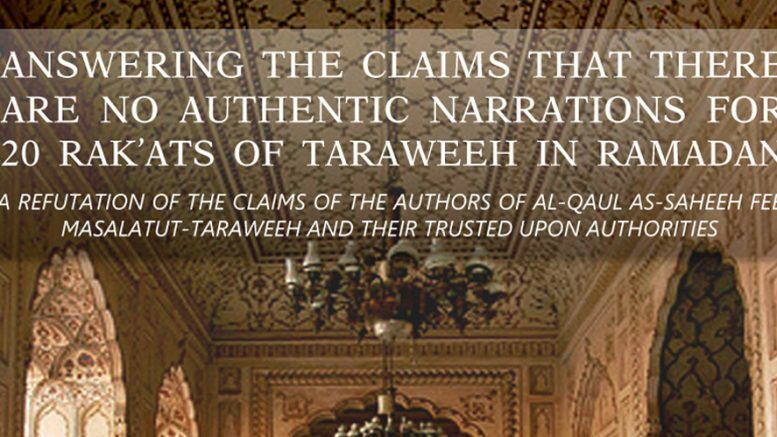 Congregational Taraweeh as a regular institution was certainly instituted by Omar, while Taraweeh as such was and is “Sunnati Rasulullah”. 6. The “Mufti” has challenged those vast Muslim populations of the World who read twenty rakaats to prove their stand from the Sihah Sittah (six authentic books of Hadith). A brave act indeed! May we request him to open Tirmizi and read the following clear verdict: – “And most of the learned men of authority have stood by (the traditions) reported by Ali and Omar and others among the Companions of the Holy Prophet (peace be with him!) in support of twenty rakaats (of Taraweeh); and that (also) is the report of Sufyan as Sauri and Ibn Al Mubarak and Shafei. And Shafei said: “This is what I found in our town of Mecca (Muslims) reading twenty rakaats”. As regards the unanimous practice of twenty rakaats of Taraweeh by the Muslims of Madina, the tradition from Muatta quoted by the League’s spokesman has already given proof. Now, Mecca and Madina were the only two great religious centres of the Muslim world of the early days. And the pious and learned Companions of the Holy Prophet (God bless him!) living in those holy cities read twenty rakaats of Taraweeh as is fully proved by the Hadtihs. The question now arises: Are those who are waxing eloquent on eight rakaats Taraweeh and fighting the Muslims on that score – are they going “back to the Hadith” or turning their back to the Hadith?!! Every honest Muslim can decide. This much by way of reply. And now it may be submitted very respectfully to the responsible persons of the League and to their religious spokesman, to have mercy on the Muslims of Trinidad, for God’s sake, and to refrain from disparaging their unity and solidarity on the basis of such issues. The writer of the statement in question has already done enough to destroy Muslim unity on the basis on such issues as the “birth of Jesus” “death of Jesus”, “Ascension of the Holy Prophet”, etc. Today the Muslims are again feeling revitalize and reinvigorated in their faith and have started moving towards the real Islamic issues. Many, who would not offer the obligatory prayers before, are now attending the Mosque with full enthusiasm to offer twenty rakaats of Taraweeh in addition. Many, who were leading sinful lives before, have repented and taken to the path of virtue and continence. Many of our ladies, who were formerly unconscious of their Islamic obligations, are now adopting the ways of Islamic cultural piety. There is a general change towards piety and virtue, which is the real mission Islam. For God’s sake, do not drown the Muslims again in such controversies and divert their minds from the immediate and vital issues of Islam. If, according to you, twenty rakaats of Taraweeh are not the Sunnah, well, they are not something haram or kufr (infidelity) or shirk (polytheism) or sin or immorality either. To read twenty rakaats instead of eight only means worshipping God more. Should it be made to cause of mud slinging and dividing Muslims into hostile camps and turning them out of the Mosques for doing so? The first concern should be to fight irreligion, atheism, materialism, sins and immoralities, which are enveloping the world today and which have no reference to the controversies on the “birth of Jesus” “death of Jesus”, “number of rakaats for Taraweeh”, etc., for which so much fuss has been created. Our Muslim brothers and sisters may be reminded respectfully to stand solidly with the overwhelming majority of the Islamic world and to treat such controversies and statements pertaining thereto with the indifference they deserve. For, it is quite possible for those who stand for curtailing Islamic obligations might someday bring forward some Hadith, without reference to the context and try to prove that the obligatory prayers are to be offered three times and not five, or that only one rakaats should be read for Witr, only to attract those for whom Islamic discipline is a burden. Whenever you come across any new fatwa, see first whether he who is issuing the fatwa has actually scholarly authority to do so. If he has no such authority, remember the advice of God: “And the servants are the most gracious and those who…… when the ignorant address them, they say ‘Peace!’……..and, if they past by fertility, they pass by it with honourable (avoidance).” (Holy Quran XXV: 63, 72). This is not the time for us to entangle any controversies, debates and fights. Give the message of “Peace” to all and sundry and save the Muslims from chaos and disunity. In the end, it is hoped that the leaders of the League may kindly refrain from addressing the Muslims with such statements, at least through the press. They have every right to teach and preach to the members of their party what they like. We have no objection to it “For you your religion, for me my religion”. (Holy Quran CIX: 6). But they may kindly permit us the opportunity to apply ourselves to the organization of the Muslims and their religious life in our humble way. Indian Deobandi: Breaking the mold? Be the first to comment on "A Refutation of League’s Mufti’s Statement on Taraweeh"